We have all suffered setbacks in our lives. In this time of uncertainty, our personal struggles can bring fear and doubt into our lives. It is hard enough to survive much less have any hope for the future. We are told in Scripture that God sends the rain on the righteous and the unrighteous. Why is that? I mean if you are trying to live and do what is right, why must you endure such the same hardship as evildoers? God always has a plan. For believers, whether you are experiencing a time of peace in your life or enduring the heat of a painful struggle, you have the assurance of knowing that all things are being directed by the hand of God. When it seems as though you are being defeated, it just means that your victory is near. There is nothing to fear in any battle for the war of life has already been won at the cross! Jesus has made you a conqueror over all that comes against you. For that reason, the enemy’s tactic is to fill your mind with despair and hopelessness since he knows that you can never be destroyed. He is attempting to kill, steal and destroy the hope you have been given in Christ. Never surrender to him what Christ has paid a price to give you! While we await the return of Christ, we are going to face trials of every kind. Although you may be feeling overwhelmed in your pain, God is always in control with full authority to bring your sufferings under submission to his will. Everything, big or small, is being worked out for the best for those who love God and are called according to his purpose. If you become anxious and hopeless in the midst of a trial, it is because you are listening to the lies of an enemy who has no power over you. There will never be a need too great or a heartache so painful that the amazing, never-failing love of Christ cannot heal. The consequence of sin and evil is all around us. Sadly, most people have become lovers of pleasure rather than lovers of God. But even as darkness fills the earth for all creation, God has provided a way for the righteous to escape. In the days of Noah, we read in Genesis 6:5, “The LORD saw how great man’s wickedness on earth had become, and that every inclination of the thoughts of his heart was only for evil. “ Although the rain flooded the earth killing everything that walked on it, Noah found favor in the eyes of the LORD and he and his family was spared. God knows how to rescue the righteous from their troubles no matter how impossible it may seem. Those who put their hope in the things of this world will perish with it. No one is exempt from the trials of this world, but the faithful who trust in the cross of Christ shall never fall. God has a deliberate, eternal purpose in allowing trials in the life of believers. You are being molded and shaped for the world to come. He is preparing a place of royalty in heaven for you that will more than compensate for your momentary troubles here on earth. David was a young man anointed by God to be King of Israel. Yet for many years he had to live his life in hiding from King Saul who wanted him dead. In Psalm 23, David wrote, “Even though I walk through the valley of the shadow of death, I will fear no evil, for you are with me.” He was a man who believed that God could keep his promise to make him King even though things looked bad. He continued to trust his God and not his circumstance! David knew that God was with him despite the fact that Saul’s whole army was out to kill him. Your battles are not yours to fight when you surrender them to Christ. Whatever valley of despair you may be in right now, remember that it is not your permanent location. It is actually a meeting place where you come to the knowledge and understanding of the God of all your strength. David trusted and knew that his struggles were just an opportunity for God to show his power. In Psalm 18:18, David wrote: “ He reached down from on high and took hold of me; he drew me out of deep waters”. Whatever deep waters of problems that you have, take hope knowing that Christ died to give you a future. 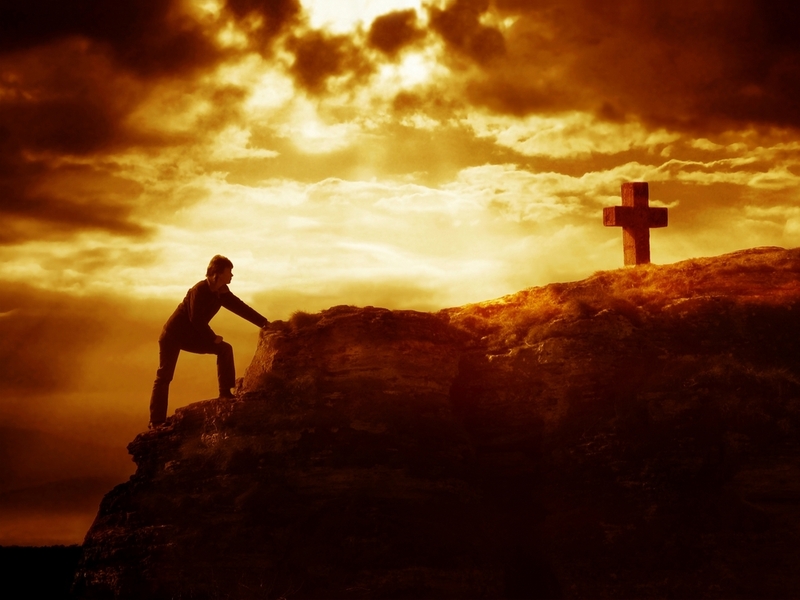 He reached down and took you this far and he has the power to take you to the end! oh Marianne, once again, you have hit my heart where it hurts! I know this. I know I have won because of Jesus, but I don’t act like it.This week has been one of the most difficult I have had, but then, when I REMEMBERED to pray SPECIFCALLY then God began to answer me. I don’t think HE answers general prayers. And mostly that’s what we pray. but tonight, I listed by amount every bill I have and need the money for, today I asked him for a breakthrough in an executive search I was doing…very specifically telling him what I needed and just like God is it looks likes He’s given me someone twice as good. He does love us so much and wants so much to bless us, but I think we have to ask correctly…I ask as the prophets did. Hi Cindy, my friend I am so glad you stopped by. I know you have been facing many health and financial difficulties. My prayers are always with you. I think that if you go to God with a surrendered heart, he will hear your requests whether you speak them or not. He isn’t interested in your words but in your heart. I know your heart, Cindy! You stand in faith despite all of your trials. That speaks volumes to God who searches to find those who trust him! It is hard not to want to tell God how we want him to answer our prayers. I have learned to present my request and then trust that his way of answering is best. It is not always easy for me to do, but it is something I am truly learning. God bless you, my sister. I will keep you in prayer. Amen! very encouraging words and as usual on time. “God knows how to rescue the righteous from their troubles no matter how impossible it may seem”. And we must hold to His words for all of God’s promises are for us Amen,we believe and belong to Him. it is sometimes hard to have hope when I don’t see a solution to my dilemmas….. But I also believe that God sees the big picture, and is therefore is in control. Hi Pat, always happy to have you visit! We both know the truth, Pat, and we know that God has promised to be with us in every storm we face. However, sometimes I get like Peter while walking on the water and I look at what is coming against me instead of the one who is protecting me and using it all for my good. It is always good to be reminded that in ALL things, Christ has shown himself to be faithful to be with us and take us through. Take care, dear sister! Your words are always a blessing to me. Hi Noel, I know that you have been going through a lot of battles yourself. It is hard to understand and have hope but by faith you must. That is what sets us apart from the world. We don’t always see our deliverance from a struggle but we take God at his word and believe that we will! You are right that God sees the big picture. He sees your tomorrow and your next year. He sees the end of your days. He knows what you need and he will provide it. Your attitude in the wait gives honor to God. Keep in mind, also, that there are a lot of us praying for you. Stay strong knowing that you are never alone to fight your battles. Hi Ron, I am so happy you stopped by and were encouraged by the message. I always pray that God will bring those here for whom he has given me this message. Keep reading your bible, Ron, and let God’s truth fill you and equip you for the struggles you face. The more you know of the God you serve, the stronger you become in your faith. God bless you, my brother! Please stop back. Marianne; this message of promise and hope is so very timely. There are so very few people living through this era of time whose lives aren’t ravaged by the enemy of our soul. We often forget that our stay here is nothing more than a snapshot in God’s eternal plan for us and that the joy of Heaven will be so complete that there will be no need for riches but even still, the poorest person in Heaven will have more riches than the earths richest king. Your words have helped me. Welcome, Rev. York, as always I appreciate your visit and comment. You are always there to help strengthen and encourage me and I am grateful. I think you may understand what I mean when I say that sometimes writing these messages is difficult because it seems like I am always saying basically the same thing. The one side of me wants to write deep theological messages on the character of God or on what is to come as ending times are at our door. Yet I keep coming back to these somewhat simple messages on the love of God and on his power to work in your life. I can write other things but somehow my thoughts always come back to those who are stuggling and in pain and my heart breaks for them. I have been through so much in my own life and all I am led to speak on is how God took me from a painful life of abuse, poverty and betrayal and gave me a future! Despite my rebellion and weakness he still deemed me worthy to tell others about what he did for me.. I hope that those who come to my site know that I am praying for them. I cry for them. And I trust that the God who took me through the fire can do the same for those who seek him. I always appreciate your friendship and prayers, Rev. York. You have been a great blessing to me! As I read your post, in my mind’s eye, I could see a maestro directing a massive orchestra. In the orchestra, there are many musicians, playing many and varied instruments, but the maestro is in control of them all. This reminded me of how God is in control of each of our lives. He knows what causes my pain, and He doesn’t get it confused with anyone else’s pain. When we call on His name, He never gets His children confused! Even when we are going through fiery trials and tribulations, God is orchestrating the events in our lives, and He is ordering our steps. As we tread through the deep waters of problems, it is wonderful to know, that God’s grace is sufficient for us, and His strength is made perfect in our weakness! We are more than conquerors through Christ! Hi Paulette, I have to tell you that I could not have said it better! You are exactly right on and it is a good reminder for me that God is indeed orchestrating each step of our lives to align with his perfect will. I thank you for visiting and commenting. You have enhanced my message with your words. God is sufficient! Do we need to know anything more than that? God bless you, my sister. You are faithful to his calling! Aw Marianne, your writing is by no means simple; the things that you see in the intimate personality of Jesus concerning his compassion for his creation goes very deep. I don’t really see that you say the same things where my greatest concern for my own writing is that I tend to say the wrong things. My wife who was the outstanding psychology student of her graduating class often scolds me for using grammar in my posts unbecoming a person of my calling always finds your writing to be very valuable to your readers. Look at Hebrews 2;18 as to why Jesus so easily touched his little ones. “FOR IN THAT HE HIMSELF HATH SUFFERED BEING TEMPTED, HE IS ABLE TO SUCCOUR THEM THAT ARE TEMPTED.” The Lord has molded you with great care while preparing you for your calling. Thank you for that word, Rev. York. I do struggle with my writing but it means a lot to me what you said. I hope you will also give my appreciation to your wife. She just lifted me up! Thanks to you both. Your words always encourage me, thank you for reminding us of these truths!! Once again I find your writing uplifting. Your message is so timely as you speak to those in trials. As you said, we all have trials. God has a purpose in them for our strength. We each have a place in His work. As you know, I just came through a fiery trial. I did not know what the answer would be, but He did. He was reminding me to focus more on His work, and his name. There are dark times and struggles, but He knows the way through them. He also knows if He has willed to send revival in our day. I hope He is! I pray that He is! But, yes or no, I do not know; but I do know that His sovereign purpose will prevail. He is Lord! He is risen from the dead, and He is Lord! May God bless you! Hi Anonymous, I am so glad that you stopped by and were encouraged. I pray that you will keep the truth in your heart. God knows how to bring you to victory! Stop back, dear friend. Hi Charles, I have watched you weather the storms you faced and you always kept your faith and your eyes on Christ. I get a lot of inspiration from your blog and you truly have beocme a treasured friend. I will keep praying for you and trusting that God has bigger plans for you than you realize. God bless you for you faithfulness to him! Greetings Ministry Addict, Once again you bring that extra dose of understanding to my message. I truly appreciate your insight! You have siad it so right; The hope we have is not like that of the world. We have a hope of things not seen but that we know by faith and the workings of God’s Spirit within us. It is a hope that is never disappointed! Thanks again for stopping by and blessing me with your comment. Thank you for this message. My sister has bipolar and my family and I are loosimg hope but I know if I continue to believe he will save us…. Hi Amy, I am so glad you stopped by. God does have an answer for all of our problems. It is hard when a family member is struggling and you feel so helpless. I will be praying for your family. Remember that this situation is under the authority of God. For those who have a living relationship with Jesus Christ, he has promised to take you through all of your trials and bring you to victory. I will be praying. Don’t give up hope and don’t let the enemy fill your mind with his lies. Trust your God! He is the only one who will never fail you. I am praying. there always someone in power. power in prayer. believing is hope. ! Michael. because whenever i am in trouble i pray. god listen to me. i am with the army national guard. going trough some rough times. Merry Christmas to all. Take care, Michael. I am praying for you. Hi Liza, I am so glad that God brought you here. In the midst of all of our struggles and every single one of our storms is our God who is at the center, in complete control, and working all things out for our good. It doesn’t seem like it now but it soon will. Keep your head up and your eyes on Christ. Watch what he can do with the faith of one who trusts him no matter how impossible their situation. I will be praying for you. Hi friend! Thank you for stopping by and commenting! You just brightened my day and i appreciate it. God sends the nicest people to bless me! Hi Marianne! I posted something back on Jan 7 2012. I’m back just to share some good news!!! After a few weeks of silence, God finally answered my prayer and it was a lot more than I had asked for. He put together the RIGHT people and the timing was IMPECCABLE. I’m pleased to say that I was able to get out of the financial crisis and now I understand the purpose of the trial. I was being taught patience and to be more frugal and careful in how I spend my money…boy did I learn my lesson. But I just wanted to come back and say THANK YOU SO MUCH for continuing to inspire and motivate people through God’s words. Your blog has inspired me to keep fighting despite how desperate situations seem. Hi Liza, I am so glad that you stopped back to encourage all of us with your good news! The truth of God is that he is more than able to work out all of our problems if we will trust him! We all have to be mindful that all that is good is given to us by God. There are times when he wants us to understand that nothing is to be taken for granted but to bless us and as we also bless others! You are right, my sister, faith and trust are so important when we present our requests to God. That is why I always tell people to be sure and read their bible. You can’t trust your God if you do not know him! Open his word and let his promises and truth fill you so that you can believe him for what he says. There are times we must wait on God but the wait is always part of the answer. When he is preparing us for something great, he must first get our hearts ready to receive it. Liza, I am so thrilled that you are understanding the power of God and his love for you. No matter what you face or how impossible it may seem, always remember that if you belong to him, he will cause it all to be used for your good. No trial can destroy a child of God. Trials are allowed to bring us closer to him! You have nothing to worry about. God already has your tomorrows planned out. Just keep your eyes on Christ and don’t waiver in your faith. He is not going to fail you. Please stop back and help encourage others on the prayer page, Liza. They need to hear your testimony. God bless you, dear sister!